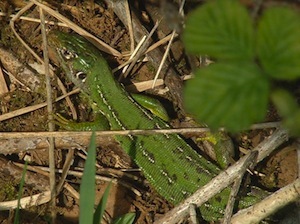 Image is of a Smargd, a type of lizard that is the symbol and name of an elite category of wines from Austria. Photo from Wikimedia Commons. Last week we posted a primer on Austrian wines including some short videos of Wil Bailey explaining the country, the styles, and why sommeliers love Austrian wines. This post will take our Austrian wine education one step deeper for you, covering such things as the Kamptal region, Smargd and Federspiel, loess soil, and more. Today Austrian wine is at the top of its game, and when you combine the high quality of these wines with the incredible food top chefs are putting out, you realize we are at a significant point of food and wine history. Recently the restaurant Noma in Copenhagen received the Top Restaurant of the Year award. When you look at their menu (and consider other northern-European inspired menus) is it no wonder their wine list is heavy on Austrian wines? (Along with Germany, Loire Valley, and Alsace having significant presence.) When talking about any of the wines of Austria, be they Gruner to Zweigelt, it’s important to remember these might be the ultimate wines with food to be found anywhere. We produced the following little videos to help explain further the world of Austrian wine. First up, the Kamptal region and why it’s unique. What is Loess soil, and why does it matter? The red wines of Bergenland are expressive, distinct, and wonderful. Here is why. Smargd and Federspiel are odd words but don’t be confused. Here is the simple way to understand them. And finally, what are the best ways to sell Austrian wine?